I’m no scholar of traditional Chinese medicine, but every year in my Medical Anthropology undergraduate class I include an ethnography of Chinese medicine in an effort to debunk the idea that there’s anything “traditional” about traditional Chinese medicine. Over the years, I’ve used Judith Farquhar’s Knowing Practice and Appetites, and, more recently, Volker Scheid’s Chinese Medicine in Contemporary China. I begin by mentioning all of this because, for me, any ethnography of traditional Chinese medicine (hereafter TCM) is necessarily approached through my pedagogical lens of whether or not it will convince my students in Santa Cruz, California that TCM is as subject to the concerns of modernity as biomedicine, Ayurveda, and other healing traditions. As such, I find Other-Worldly the best of the recent ethnographies of TCM for classroom use. Mei Zhan’s interest in the transnational situation of TCM beautifully depicts this system of medicine as thoroughly untraditional and deeply subject to whims that are neither Chinese nor originating in China. Additionally, as an anthropologist of the United States and of science and medicine, I am particularly interested in the possibilities which Zhan’s book suggests for future research on the transnational conditions of medicine and its many forms. In chapter one, “Get on Track with the World,” Zhan discusses the last fifty years of TCM in China, and the various attempts on the part of diverse actors to globalize TCM. From Mao Zedong’s attempts to construct a global proletariat, connecting African citizens with China through medical practice, to the contemporary attempts to prove the efficacy of TCM through Western scientific methods, ostensibly an effort to modernize and “whiten” TCM. At these different points in history, what TCM is and can do is re-imagined by the actors involved – from a mechanism for uniting peoples across national borders in a global class struggle, to a means of integrating China in the “modern” world dominated by the West (as Chinese TCM practitioners perceive it to be). This is succeeded by a chapter that focuses on lay critiques of TCM practice by Americans, specifically the view that TCM is more sympathetic to patients than biomedicine. Zhan develops this into an argument about the changing dynamics of expertise in TCM, as competency and care are differentially valued by practitioners and patients, and valued differently based on the context in which they are being deployed. Chapter 3 focuses on the ways that TCM practitioners and patients make recourse to the language of “miracles” to explain the efficacy of TCM. When all other medical options have failed, or when TCM offers an inexplicable cure (for cancer or other chronic conditions), TCM continues to be marginalized by its practitioners and patients when practitioners and patients turn to the language of medical “miracles” to explain its efficacy. This position of marginalization both facilitates and necessitates the language of miracles – if TCM were more accepted and better understood, the language of miracles would give way to a language of clinical efficacy and evidence-based medicine. These concerns are the heart of chapter 4, in which Zhan focuses on the efforts to translate TCM and its ontological premises into biomedical terms. Chapter 4 offers the most detailed account of the practice of TCM, and, in this case, is based in a teaching clinic, which highlights Zhan’s concerns of translation, as international students question the practices and efficacy of particular therapies, as well as the presence of particular conditions outside of China. Chapters 5 and 6 focus more closely on the articulations of TCM in the United States, first focusing on the place of gender and kinship in the continuance of medical knowledge and practice, and secondly on the convergence of multiple stakeholders in U.S.-based conferences of TCM practitioners and consumers. As Zhan discussed in chapter 5, “Engendering Families and Knowledges, Sideways,” most histories of TCM highlight only the men who have played important roles in the development and institutionalization of TCM; by looking at the women of powerful TCM families – daughters and wives – this hegemony of men is quickly upset, in no small part due to the migration of individuals, families, and TCM to the U.S. As the women and men of Chinese families pursue careers in TCM or biomedicine, ideas about the place of gender in “traditional” medical practice and knowledge transmission are upset and reconfigured. Finally, in chapter 6, Zhan attends to the multiple global stakeholders in the further institutionalization of TCM, showing how interested parties in China and the U.S. differentially emphasize the “traditional,” “Chinese” and “medical” aspects of TCM. For some, the “traditional” is to be overcome on the road to modernity; for others, the “traditional” proves elusive but remains the source of TCM’s power and efficacy, hence the language of “miracles” and the continuing Orientalization of China by TCM consumers. What holds these chapters together is Zhan’s elaboration of “worlding,” a concept borrowed loosely from Heidegger as a means to unsettle accounts of globalization that assume the unproblematic and even flow of knowledge and practice. She elaborates, that “worlding” is “not…a replacement for globalization but [is] an intervention that disrupts transitional and transcendental discourses of global capitalism, and as a heuristic device to think through the multiple spatiotemporalities in and of knowledge production – that is, multiple and effervescent worlds in the making” (24). She explains in the book’s conclusion that worlding “emphasizes the ways in which various terms of difference are invented, negotiated, and deployed in everydayness….an ethnography of worlding conceptualizes difference as the contingent outcome rather than the starting point of translocal encounters and entanglements” (201). In offering this counterpoint to abstract theories of globalization, Zhan participates in the accumulating literature emphasizing the situations and particularities of transnational migrations of peoples and practices, placing these concerns firmly in the realm of medicine and its deployment. As such, Other-Worldly makes an interesting parallel to Karen Flint’s recent historical study of Ayurveda and south African medical practices in collision, Healing Traditions, and Roberta Bivins’ Acupuncture, Expertise and Cross-Cultural Medicine. Increasingly, medical anthropologists, as Zhan suggests, need to focus both on the conditions of medical systems and their migrations, but also the worlds they create when they touch down in these new contexts and the strange cultural concerns they provoke and facilitate. I have two concerns with Other-Worldly, which stem from my particular interests in the anthropology of the U.S. and in Actor-Network Theory. In the case of the latter, one of Zhan’s efforts in Other-Worldly is to make evident the possibilities of a marriage between medical anthropology and science studies, particularly post-Latourian Actor-Network Theory. In so doing, she emphasizes the role of various human actors spread throughout the network of TCM that extends beyond China to the U.S., and, in a more tertiary fashion, to Africa. And while this perspective is engaging and helps to unravel TCM as a solely Chinese concern, it also only focuses on the human actors involved in the network. There are some hints at the nonhuman actors – acupuncture needles, herbs and other substances used in TCM tinctures, meridian charts, jars used for cupping, authoritative medical texts and case studies – and their worlding is as vital to understand as the knowledge practices of TCM as the human actors involved. I would suggest that these nonhuman elements may be even more important than the human actors, as the efficacy of TCM relies not so much on the presence of “authentic” practitioners as efficacious materials. One of Zhan’s interlocutors discusses how Americans are squeamish about the needles used in acupuncture, necessitating the use of smaller gauge needles than are used in China; how does this change the practice of acupuncture and its efficacy? What are the supply chains and collection practices of TCM practitioners in the U.S. and Africa in the composition of tincture recipes? Not all of the ingredients are available everywhere, and local conditions surely influence the materials that are distilled into medical substances. These kinds of questions are vital in any Actor-Network approach to the contemporary practice of TCM and its elaboration in non-Chinese contexts, and might show how TCM’s material effects vary depending upon its local contexts – which leads me to my second concern. Any translocal ethnography needs to be equally contextual in its understanding of the situations in which the practices under scrutiny are deployed. While there is ample historical detail of the Chinese context of TCM, there is very little discussion of American history or the development and deployment of biomedicine and its alternatives over the 20th century. This might seem unnecessary, but understanding the worlding of TCM in the U.S. depends equally on establishing the sociohistorical contexts of both China and the U.S. It’s often easy to settle into an acceptance of biomedicine’s hegemony, but this is a recent and fraught phenomena, and a tacit acceptance reifies the claims and status of biomedicine, implicitly marginalizing alternative medical forms. Americans spend more money annually on alternatives to biomedicine than biomedicine itself, and this isn’t new so much as it is a continuation of a 200-year struggle to achieve respectability and dominance on the part of biomedical practitioners and institutions. Which is all to say that conceptualizing the worlding of TCM also depends on understanding the worlding of biomedicine, both in the U.S. and globally. One cannot be thought without the other. These twin concerns are less complaints with Other-Worldly than they are invitations for future research that takes Zhan’s theory of worlding seriously, and pursues its capacity to explain other knowledge practices as they move around the globe, as well as the material conditions in which they are brought into being. Other-Worldly helps to push discussions in the anthropology of medicine into important directions, and raises questions that demand our attention, as anthropologists and as scholars of medicine in its many forms and its translocal contexts of practice. 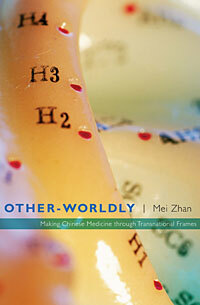 Wolf-Meyer M. Mei Zhan’s Other-Worldly: Making Chinese Medicine through Transnational Frames. Somatosphere. 2010. Available at: http://somatosphere.net/2010/mei-zhans-other-worldly-making-chinese.html/. Accessed April 24, 2019. Wolf-Meyer, Matthew. 2010. Mei Zhan’s Other-Worldly: Making Chinese Medicine through Transnational Frames. Somatosphere. http://somatosphere.net/2010/mei-zhans-other-worldly-making-chinese.html/ (accessed April 24, 2019).